When exiled to a place where charcoal and gas are forbidden, the griller doesn't have a lot of options other than electricity. The problem is that 120 volts aren't a lot of power to do high-temperature grilling. Well, after some considerable development time, Weber produced an electric version of its popular Q line of grills that runs on electricity. Capable of temperatures higher than 600 F thanks to the efficiency of this design, this grill can sear a steak, heat up quickly, and recover its heat faster after you lift the lid. While a small grill, if you are limited to electric grills, buy this one. The Weber Q grills have become a very popular choice since they were introduced. 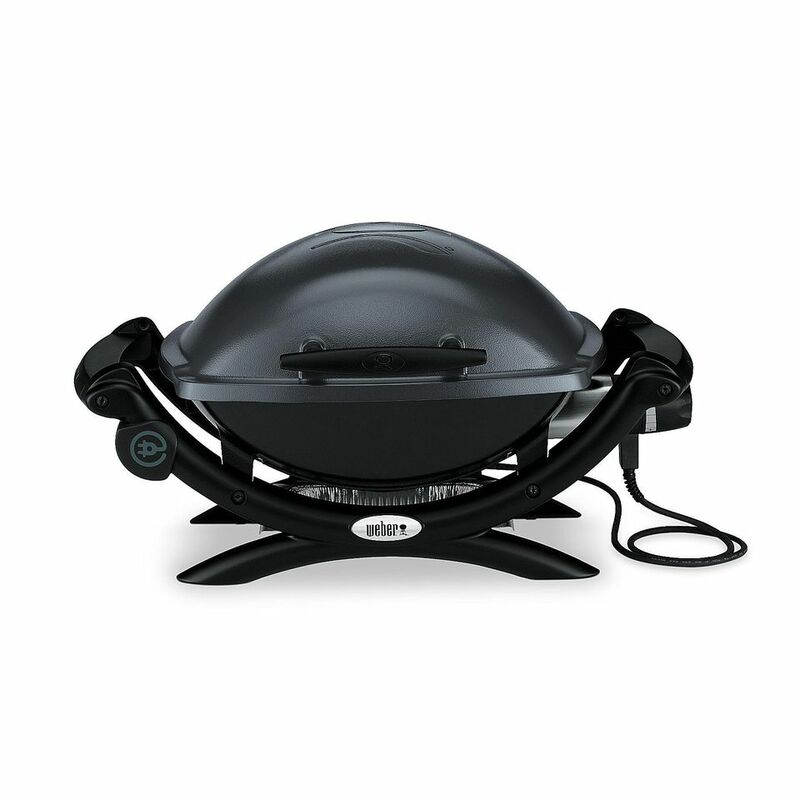 These portable grills range from the small Q 1000 to the nearly full-sized Q 3000. The combination of the simple design with efficient heat output makes these grills powerful and small. Now Weber has introduced an electric version of the Q grill for those of you confined to locations where gas or charcoal grills are not allowed. The reason it took so long to develop was solving the problem of low-heat output from electric grills because of the limits of 120-volt power. It typically takes a lot of wattage to get a lot of heat, but Weber has managed to design a grill that can hit temperatures higher than 600 F.
What makes this grill work is the sealed, aluminum-insulated design that holds all the heat in and reflects the heat inside at the food you are cooking. Add the heavy stainless-steel cooking grate and you get great contact heat to produce good sear marks on your food. The two issues that stand out about this grill are a small size and the price. This grill is small because of the heat issue. You can only draw so much wattage, so making a larger electric grill is pretty much impossible. This grill is large enough to cook a pair of steaks and maybe four hamburger patties, but that's about it. If you need more food you are going to have to cook in shifts. This isn't a cheap grill (in any sense of the word). Of course, if you are limited to electric, then this is the best grill out there to choose from. Is the Char-Broil TRU-Infrared Grill2Go X200 Portable Gas Grill Good? Should I Buy the Weber Summit Charcoal Grill?